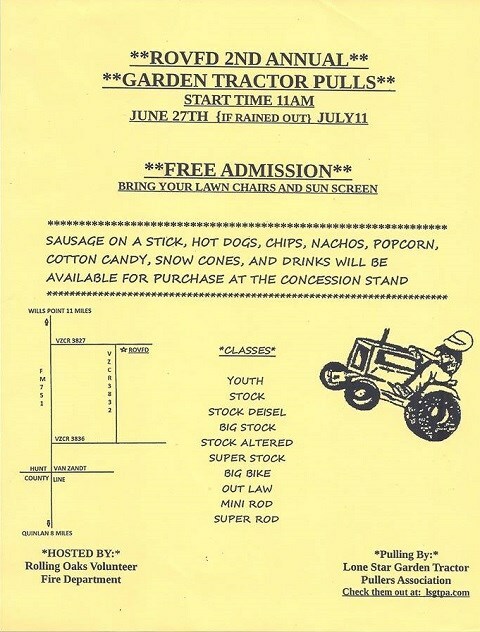 The Rolling Oaks Volunteer Fire Department will be hosting the LSGTPA pulling teams on July 11, for two rounds of tractor pulling action ! The event will be held at the Rolling Oaks VFD facility, near Lake Tawakoni. Visit the LSGTPA web page for detailed directions to the event. ROLLING OAKS VFD hosts the LSGTPA tractor pulling event on July 11.